This recipe is taken from The Best of Bridge. It is under the appetizer section, but we often make it for dinner since we love it so much. 1. Preheat oven to 375 deg.F (190 deg.C). To thaw and prepare phyllo, follow package instructions. 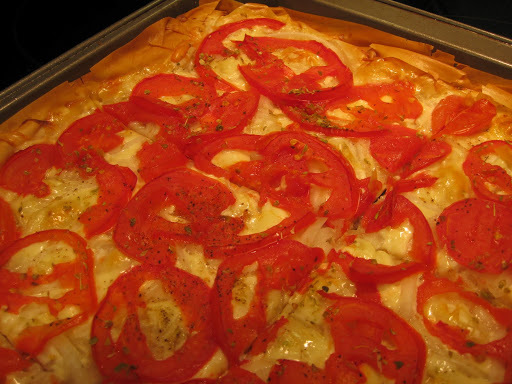 Place first sheet of phyllo on baking sheet, brush with butter and sprinkle with 1 Tbsp. (15 mL) Parmesan cheese. Repeat until all sheets are used. Press firmly so layers will stick together. Sprinkle top sheet with Mozzarella and onions. Arrange tomato slices on top. Season with oregano, salt and pepper. Bake for 20-25 minutes, until edges are golden. Decorate with herbs and cut into squares. Note: Olives, anchovies, peppers can also be used – but don’t overload as this is a delicate crust!